Perhaps you want to grow summer carrots very early in spring. In gardening books and on the internet you find articles about germinating carrot seeds in peat-dust or moist sand. The moist, sticky germinated seeds must be carefully sown in the garden soil. I think that this sowing method is not so easy. You better sow carrots indoors in a special tray with sowing soil. And later, shove the block of sowing soil with carrot plants in the garden soil. The method is called “Shoving soil”. Or you can grow summer carrot plants indoors on moist toilet paper. Put the mini summer carrot plants in the garden soil under a tunnel greenhouse. This method is called “Planting mini carrots”. I think that “planting mini carrots” is an easy procedure. That method is decribed below in the first chapter. Germinate seeds of summer carrots in a margarine box on moist toilet paper. Put the box with summer carrot seeds on a warm spot at 20 to 25 C (68 to 77 F). A detailed description about this germinating method in tip 2) Simple tools and tips , number 73. Regularly check the germinating (after check, put on the lid again). Let the carrot seeds germinate until they look like the seeds on the photo above. 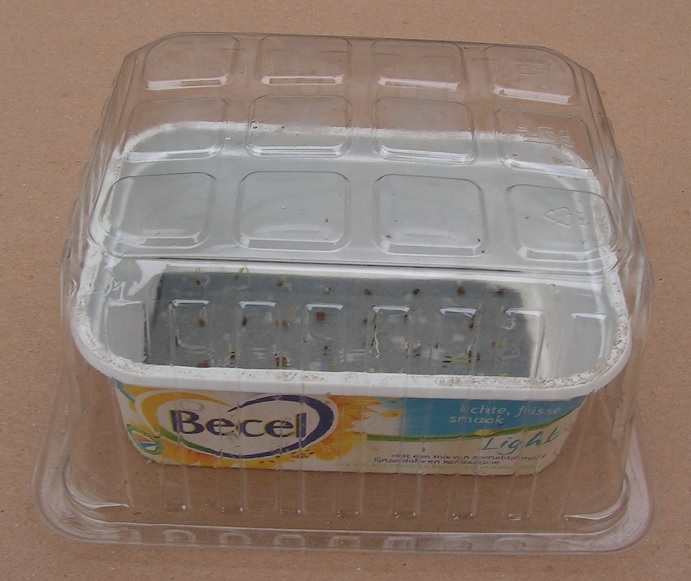 Then put a transparent box over the margarine box with germinating seeds. Put the whole indoors at a bright spot (before a window) at 18 to 22 C (64 to 72 F). Let the mini carrots plants grow bigger on moist toilet paper. Regularly check if the toilet paper is moist. When needed, add water on the paper. Afer a while the mini carrot plants have grown bigger. 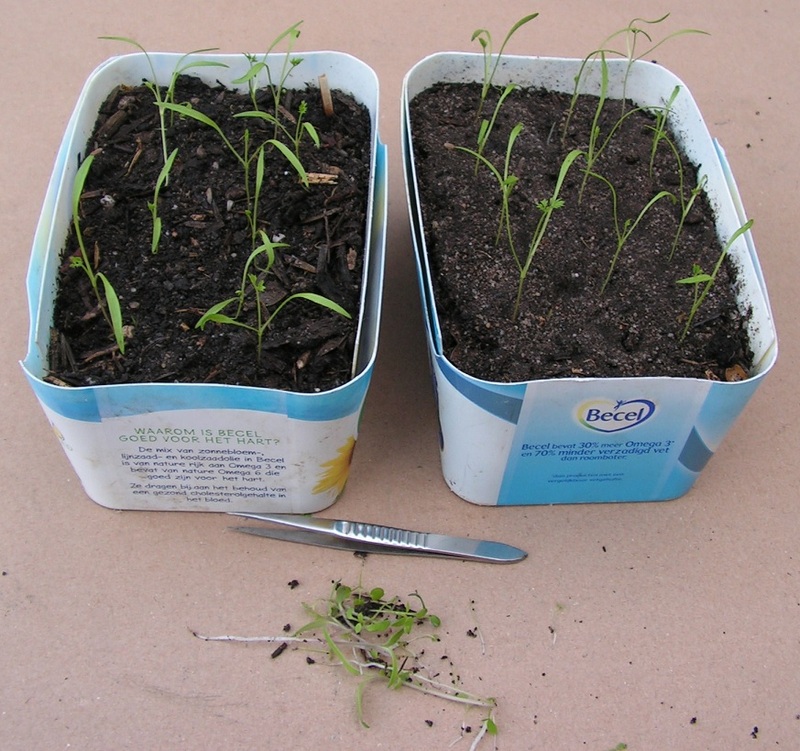 The same mini carrot plants after removal of the transparent box. Now the mini carrots are big enough to plant in the garden soil. The mini carrots are planted out at this spot in the garden soil, under a tunnel greenhouse. A few days before the planting date you can loose (or dig) the garden soil and put a transparent tunnel greenhouse over it. Close the tunnel after putting it on the soil. So the soil under the tunnel can warm up by day. Open the tunnel right before planting the mini carrots. Before planting loosen the garden soil (again). That goes well when using a garden trowel. When needed mix some agricultual lime through the soil. Shove some garden earth aside to make a shallow planting bed. Put a mat with holes on the soil in the planting bed. In Tip 2) at number 70 there is a description of this mat. Distance between the holes of the mat is 3 centimeters (1 3/16 inch). Use a pencil to make small pits in the garden soil. Remove the mat with holes. Small pits are visible in the garden soil, at the bottom of the planting bed. Spray water on the toilet paper right before picking the mini carrots. At moist toilet paper, the mini carrots let loose much easier. You can pick each mini carrot plant between thumb and index and “pull” it from the moist toilet paper. A mini carrot plant has 2 green leaves, a green piece of stem, a white piece of stem, and a white root. Put the mini carrots in the garden soil as described below. Carefully pick the mini carrot at a green leave or at the green stem. Shove garden earth in the pit while holding the mini carrot at the same height. Shove more garden earth around the mini arrot to fill the pit. Put mini carrots in the soil until the planting bed is full or until there are no more mini carrots. Use a watering can with a “fine” shower head to spray water on the soil and on the mini carrot plants. This spraying goes well when “wagging” the shower head over the planting bed. You can put a transparent hood over the planting bed. To have extra protection against cold. Put a watering can filled with water next to the planting bed. (The water in the can makes the air under the tunnel moist. This delays the carrot plants from freezing). You can put small corrugated plates or perspex plates against the ends of the tunnel. When using persplex plates, temperature under the tunnel is some higher than using corrugated plates. At the “shoving soil” procedure, summer carrots grow indoors in a tray filled with sowing soil. Later on the block of sowing soil with small carrot plants is shoved in (on) the garden soil. Below there is much info, tekst and photos about this procedure. Fill an oblong tray with sieved sowing soil. The tray has one short side that can be opened. Or fill a “shove tray” (with insert) with sowing soil. A “shove tray” is a margarine box with one short side open. It fits in an insert tray. Lay carrot seeds on the sowing soil. Cover the seeds with dry sieved garden sand or sowing soil or compost. Let the seeds germinate indoors. Have the carrot plants grow in the tray until they are about 1 inch (2,5 cm) high. 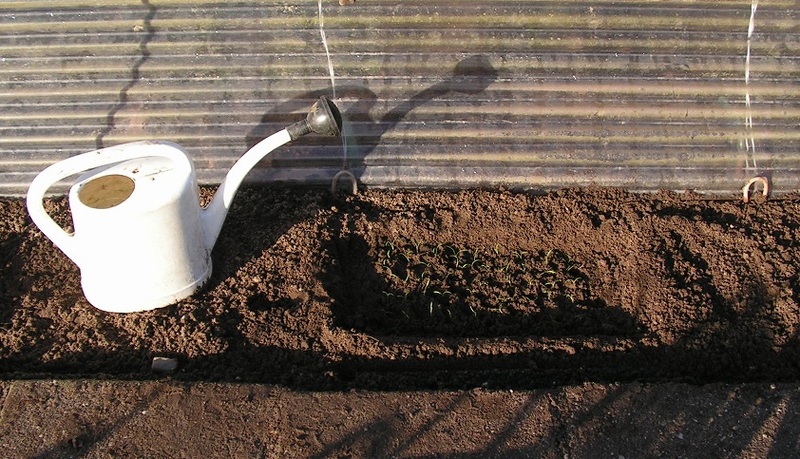 Shove the block(s) of sowing soil with small carrot plants from the tray into a furrow in the garden. When you put a putty-knife under the block of planting soil (before shoving), the block gets loose and shoving is much easier. Put some garden earth against the sides of the blocks. The carrot plants can grow bigger in the garden soil. A known method is shoving pea-plants into the garden soil. Bram, (living in The Netherlands) sent me a reaction with link. Here is the link . Summer carrot plants are much smaller than pea-plants when they are shoved. So shoving carrot plants needs more care. From the end of 2016 I use a small “shove tray” to sow summer carrots in. The tray has been made of margarine boxes. The whole block of sowing soil with carrot plants is shoven out of the tray on the garden soil. The making of the shove tray is described in tip 2 nr 68. The shove tray and the insert are easy to make; use scissors to cut them out of 2 plastic margarine boxes. To make the oblong tray, you have to saw off one short side with a hack saw. And you have to make a well fitting loose side wall. 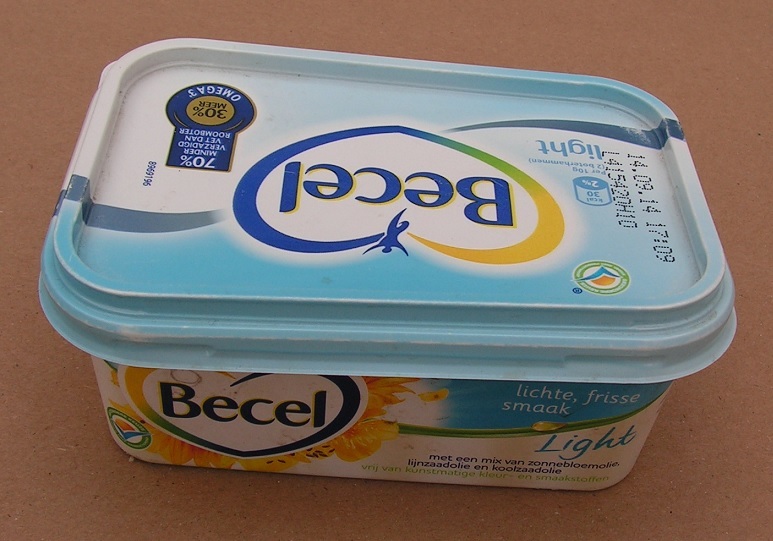 The tray made of margarine boxes is small and needs little space. Indoors you can use many trays to grow carrot plants in. The small shove trays are easy to handle, to place etcetera. When shoving the block of soil on the garden soil, you need little “free space”. You can shove the whole block on the garden soil in one movement. When using an oblong tray, you have to divide the block in 3 or 4 parts. And shove each part seperately. The procedure with the small shove trays made of margarine boxes is described right below in chapter A2) to A6). Further in this tip you find the (old) description of using an oblong shove tray. The description starts at chapter B)#. In tip 2 nr 68 there is an description of making the small shove tray and insert. Put a shove tray in an insert. This forms a combi. Prepare sowing soil: mix sieved compost or sieved potting soil with agricultural lime. Ratio: 1 part of lime to 20 parts of compost or potting soil. Fill the combi with sowing soil. The top of the soil is about 0.5 to 1 centimeter (1/5 to 2/5 inch) below the edge of the combi. Press softly (with the bottom of another filled margarine box) on the sowing soil. Lay a piece of placemat with holes on the sowing soil. At this mat, the distance between the holes is about 3 centimeters (1.2 inch). More in fo in tip 2, nr 70. Make sowing holes in the soil. Depth is about 0.5 to 1 centimeter (0.2 to 0.4 inch). Or lay a piece of sink mat on the soil. At this mat, the distance between the holes is about 2 centimeters (0.8 inch). Sow 3 or 4 dry carrot seeds in each sowing hole. 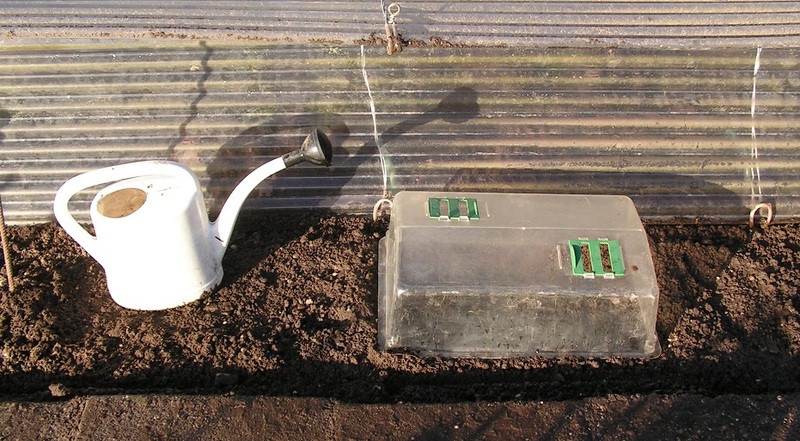 You can use a shift fall tray with one tube for sowing. See tip 33 for more info. Or put carrot seeds in a white tray. Use tweezers to pick and to drop the seeds. After sowing, remove the mat from the soil. You can use tweezers or a little stick to do that easily. Strew a thin layer of dry sieved sand on the seeds in the sowing holes. Or strew some sieved compost or potting soil in the holes. Put a standard 500 grams margarine box upside down on the combi. This forms a greenhouse made of margarine boxes. More info about this greenhouse in tip 2, nr 1. Remove the top margarine box (500 grams upside down) when first carrot plants are visible. Not all carrot seeds in (deep) sowing holes in compost or potting soil do germinate. Some seeds start rotting or no plants shoot up. Or germination starts after a very long time. So you better sow 3 or 4 seeds in each sowing hole. Strew a layer of sieved moist (garden) sand on the sowing soil. Layer thickness about 1 centimeter (0.4 inch). Make shallow sowing holes in the moist sand. Drop a few dry carrot seeds in each hole. Do not cover the seeds right after sowing. Put a standard 500 grams margarine box upside down on the combi. Put the whole at a warm place, for example on top of a central heating unit. Maybe the carrot seeds germinate better on “clean sand” and at a higher temperature. Use tweezers to pick 1 germinating seed with a short root. Drop this seed in a sowing hole with no germinating seeds. Repeat these steps at more holes (during the next days) until there is at least 1 germinating seed per hole. In this way you end up with carrot plants at 11 positions in the sowing soil. Remove the top margarine box (500 grams upside down) when carrot plants are bigger. Put the whole at a light place at about 15 to 20 C.
Strew some sieved dry (or moist) sand next to the little carrot plants in the sowing holes. Let the plants grow bigger. You can lay germinating carrot seeds on or in the sowing soil. On these photo’s there are germinating summer carrot seeds on moist toilet paper. Many seeds have a tiny white root. 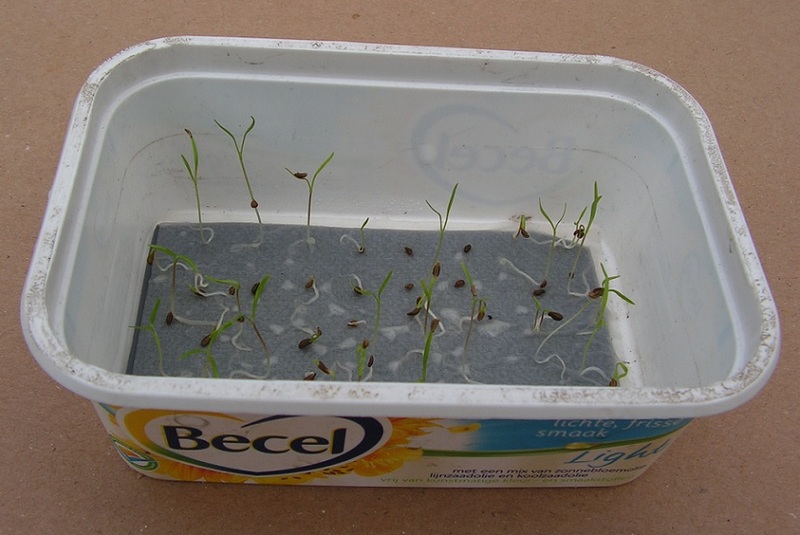 Further in this tip at I)# Germinating summer carrot seeds on moist paper you find info about germinating. Spray water on the soil before sowing. Lay a (place)mat with holes on sowing soil. Make shallow sowing holes in the soil. Remove the mat from the soil. Use tweezers to pick each carrot seeds with a small root from the moist paper. And to drop it in a sowing hole. spray water on the leg to remove the seed and to drop it in the hole. pour a tea spoon of water over the seed and let it drop in a hole. pour a (half) tea spoon of water in a hole just before sowing. Submerge the tweezers with a seed in the water. The seed releases from the tweezers then. This photo shows germinated carrot seeds in sowing holes. Strew a thin layer of sieved dry sand on the seeds. Remove the top margarine box (500 grams upside down) when first carrot plants are visible, above the sand. Let the plants grow bigger indoors. At each sowing spot with 2 or more plants, use scissors to cut the smallest plants right above the soil. Make sure that 1 plant remains at each sowing spot. On the photo above you see carrot plants before thinning. In these shove trays there are single summer carrot plants. Between the carrot plants, there are small weed plants, originating from my compost. You can use tweezers to remove the weed plants carefully. Water the soil after this weed removal, so the roots of the carrot plants are firm growing in the soil again. In January, February or the beginning of March (mid to late winter) you can shove the block of sowing soil in the garden. The outside temperature is low during that period. So you better put a (tunnel) greenhouse over the little plants after shoving. 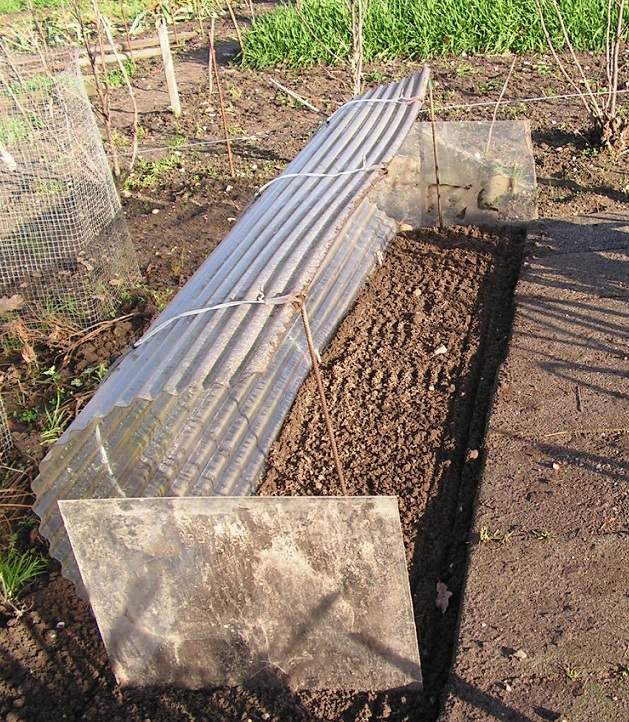 You can start with putting a (tunnel) greenhouse on fresh digged garden soil. The garden soil under the greenhouse can warm up during the time before shoving the carrot plants. Make sure that the greenhouse is windproof. When using a tunnel greenhouse , you better put flat closing plates at both ends of the tunnel. That’s warmer then using corrugated end plates. On the next photos there are plexiglass end plates visible. Open the tunnel right before shoving the carrot plants. Put the combi with small carrot plants on a flat surface. Fill a small beaker with cold (tap) water. Pour the water on the sowing soil. Wait at least 5 minutes before continuing. In the mean time the water can drop in the soil. Moist sowing soil is easier to shove out of the tray. And moist soil is sticky, so it does not fall apart so easily during or after shoving. Use a fork or a garden shovel to loosen the garden soil deeply. 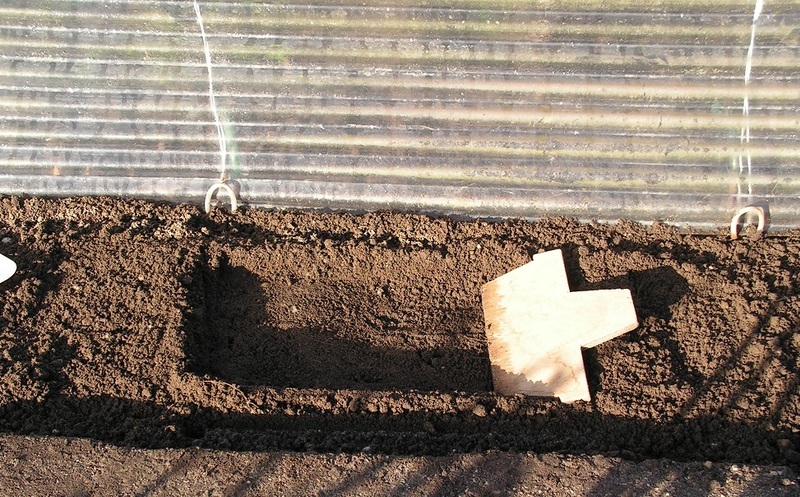 Use a small wooden board to make a furrow in the soil. Sprinkle some agricultural lime on the soil in the furrow, when desired. Use a garden shovel to mix the lime with the soil and to loosen the soil deeply. Straight carrots grow in loose garden soil. In compact garden soil you get crooked or branched carrots. Again use a small wooden board to make a furrow in the soil. Put the combi in the furrow on the soil. Carefully lift the shove tray out of the insert. Put a putty-knife under the block of planting soil so the block gets loose. After this, shoving is much easier. Put a putty knife in the shove tray near the short closed side. Carefully pull the shove tray underneath the block of sowing soil with plants. In the mean time use the putty knife to retain the block of sowing soil. Put the “next” combi in the furrow. Put the shove tray next to the “previous shoved” block in the furrow. Carefully shove the block with little carrot plants on the soil. It can happen that the blocks of sowing soil fall apart. Then use a small wooden board to keep the blocks in shape. Use a putty knife to shove some garden soil against the sides of the blocks. When no more blocks present, shove garden soil against the blocks to fill the furrow. The blocks are soaking wet, so no water to be sprayed on. Put a tray with water on the garden soil in the greenhouse. The water makes the air moist. And during frosty weather, water freezes before the carrot plants will freeze. After shoving the carrots, put a greenhouse (tunnel) over the plants (again). A greenhouse is sufficient at non freezing weather. At cold, freezing weather put a plastic transparent cover over the carrot plants. The tunnel greenhouse is put over this plastic cover. When you have put many small carrot plants in the garden soil, you can put 2 overs next to each other over them. Caution; do not plant the carrots at the position where 2 hoods meet. Plants at that position will be flattened by the edges of the covers. 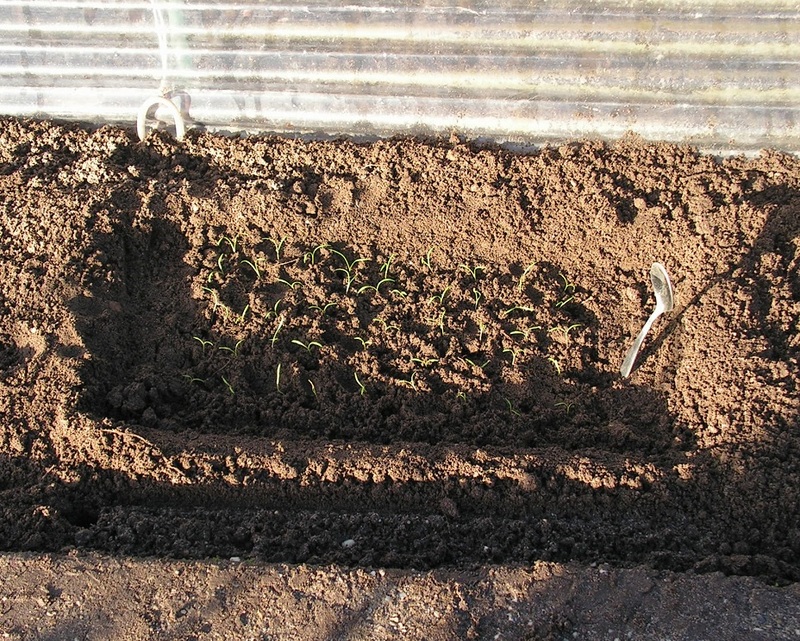 After shoving the carrots, put a greenhouse (tunnel) over the plants, the covers and/or the trays with water. When very cold, freezing weather is forecasted, put plastic foil over the greenhouse. Put bricks on the ends of the foil against blowing away. Remove the foil at non freezing temperatures. 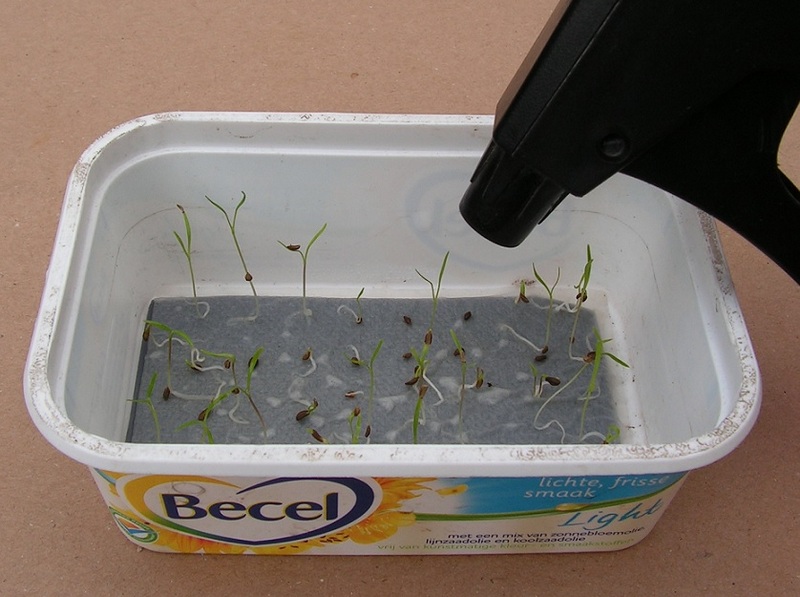 Below there is the “old” description (2012) of sowing carrot seeds in an oblong plastic tray. And shoving splitted blocks of sowing soil with carrot plants into the garden soil. Use a plastic tray of about 12 inch (30 cm) long, 2 1/4 inch (6 cm) wide and 2 inch (5 cm) high. For example a cutlery tray of Curver, price about €2,00. At this tray one short side is open; the side wall has been removed by sawing. Needed too: a plastic L-shaped plate, two rubber bands, a long one and a short one. Close the open side of the tray using the L-shaped plate and rubber bands. The long rubber band should not be too tight or too small. Because then the side walls at the open side will get too close to each other. This will deform the tray. Sowing soil; a mixture of sieved compost, sieved garden soil and agricultural lime. Sieve compost and soil through the bottom holes of a plastic flower pot (see tip 2). Mix 10 parts of sieved compost with 10 parts of sieved garden soil an 1 part of agricultural lime. This mixture will be loose thanks to the sieving. And loose sowing soil is good for carrots. Fill the tray with sowing soil. Level the soil in the tray using a filling knife (or a small board or so). Press softly on the soil using the bottom of an empty margarine box (or a small block of wood or something like that). Spray cold tap water on the sowing soil. Let the water drop into the soil. You can sow carrots each 2 cm (0,8 inch). That goes well when using a small piece of sink mat with holes (see tip 33). Lay the mat on the sowing soil. This wooden “sowing stick” is used to make round sowing holes in the soil. The stick is put into each hole of the mat to make a sowing hole in the soil. All sowing holes have equal depths due to the mat and the rubber band on the stick. The stick has a \ / shaped point. This makes the seeds fall in the middle of the bottom of each sowing hole. Make sowing holes in the soil; put the stick into each hole of the mat until the (red) elastic band reaches the mat. Meanwhile turn the stick a quarter or a half. Then take the stick out of the mat hole. In this way you can make all desired sowing holes in the soil. In this description all (42) holes of the mat are used to make 42 sowing holes. When you want more distance between the carrot plants, use less mat holes and make less sowing holes (for instance 21 holes). You can sow dry carrot seeds into the holes. That is easiest. But you can also germinate carrot seeds on moist toilet paper. And then drop each germinated seed with a “tiny root” into a sowing hole. Below there are descriptions of both methods. Dry carrot seeds are sown in the sowing holes while the mat is on the soil. 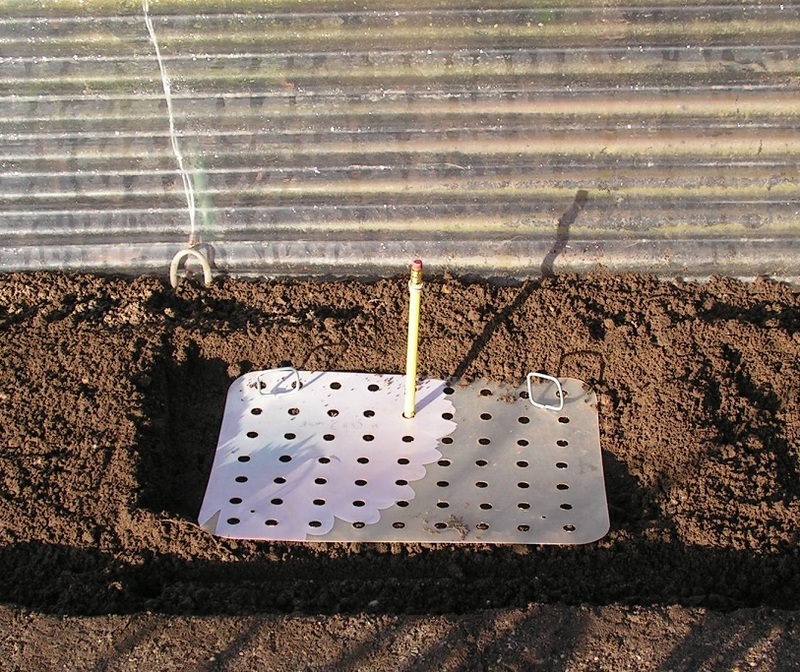 Sowing carrots goes well when using an adapted “shift fall tray” (see tip 33). The “fall tube” has been made of a of an empty silicone nozzle (as used at sealant tubes). This idea is from Dirk (living in The Netherlands). A silicone nozzle is much thinner than a water tube and it fits into the holes of a mat. Near the end of the nozzle there is a (brown) rubber band. This band prevents the “fall tube” from going too deep into the sowing holes and thus from contaminating with moist sowing soil. On this photo you see that the sowing stick is put deeper in the mat than the “fall tube”. So the “fall tube” end does not touch the bottom of the sowing holes. Put dry carrot seeds into a “shift fall tray”. Each time put the fall tube into a mat hole untill the brown rubber band touches the mat. Then use a finger to shift one seed to the hole in the tray and have the seed drop into the sowing hole in the soil. When you don’t have a shift fall tray…. ….. strew dry carrot seeds into a small (white) tray. Seeds are well visible then. Use tweezers to pick each seed and drop it into a mat hole. After sowing, remove the mat from the sowing soil in the tray. This goes well when using tweezers to pick up the end of the mat. On the photo you see sowing holes with one seed in each hole. When you click on the photo above, you get a screen wide photo. On these 2 photos you see 30 out of 42 sowing holes. Seeds have been sowed using a mat and a shift fall tray. In each hole there is one seed, laying (about) in the middle of the hole. Needed too; sieved dry garden sand (or masonry sand or sandbox sand) and a tea spoon. Strew a thin layer of dry sand in the sowing holes on the seeds. This goes well when using a tea spoon. Then lay a “lid” on the tray against drying out of the soil. See further in this post. During sowing seeds in all (42) holes, some moist soil has sticked to the edge of the opening of the fall tube. This is no problem. Each seed could still fall free and in each sowing hole a seed has dropped. Germinated seeds are sown without mat. So after making holes, remove the mat. Then you have a tray with sowing soil and (42) sowing holes as shown on the photo above. On this photo you see carrot seeds on moist toilet paper. Many seeds have a small root. 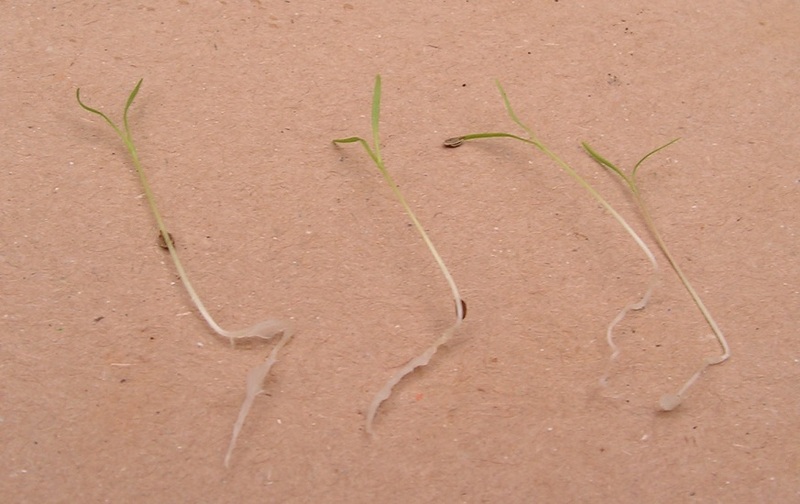 Further in this post, at I)# Germinating seeds on moist paper this germinating is described. Each time use tweezers to pick a carrot seed with a small root from the moist paper and drop the seed into a sowing hole. Often the moist seed sticks to (one leg) of the tweezers. Hold the point of the tweezers with seed above a sowing hole. Then spray cold tap water against the tweezers and rinse the seed into the hole. Hold the point of the tweezers with seed above a sowing hole. Use a tea spoon with cold tap water to rinse the seed from the tweezers into the hole. Pour water into an empty sowing hole. Then put the point of the tweezers with seed into the water in the sowing hole. Take the “empty” tweezers point from the sowing hole. You can use a small pipette to rinse the seed from the tweezers. Here you see germinated seeds in 8 sowing holes. After sowing, put some dry sand in each sowing hole on the seed. Use a tea spoon. Here, on the right side of the tray, you see 9 sowing holes (where I sew carrot seeds in), covered with dry sand. You can use a cocktail stick to mark the position where you stopped sowing. 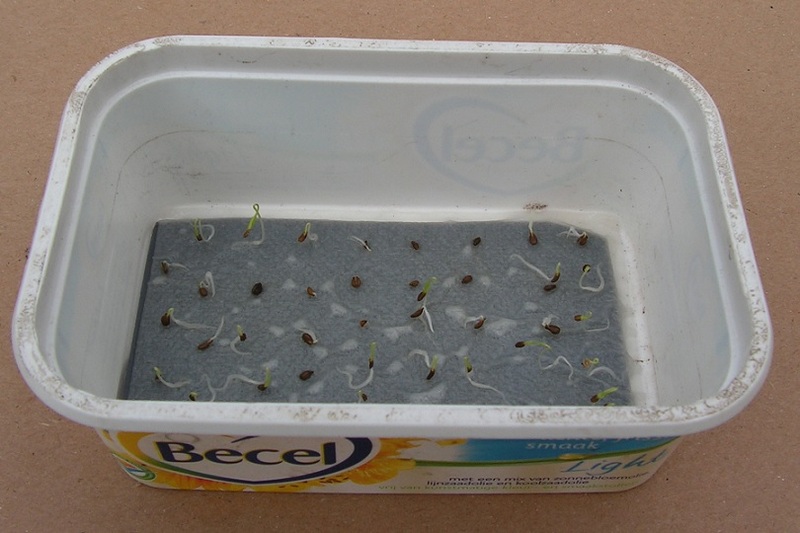 After sowing the germinated seeds, cover the tray is with a “cardboard lid”. This prevents sowing soil from drying out. After 24 hours, there will be new germinated seeds to lay into sowing holes. Until that time, the lid is on (see E)#). Put a lid (piece of cardboard in a plastic bag, rubber bands around it) on the tray. Let the seeds germinate at about 68 F (20 C). 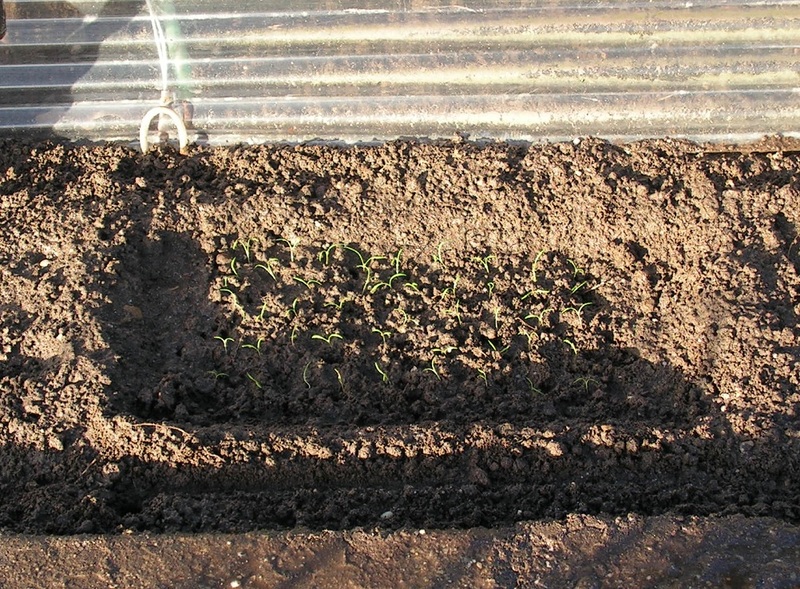 This photo shows first carrot plants (dry seeds sown). In some sowing holes there is a small plant, in other holes no plant is to be seen. On the 2 photos above, you see carrot plants (germinated seeds sown). In each sowing hole there is a tiny plant. 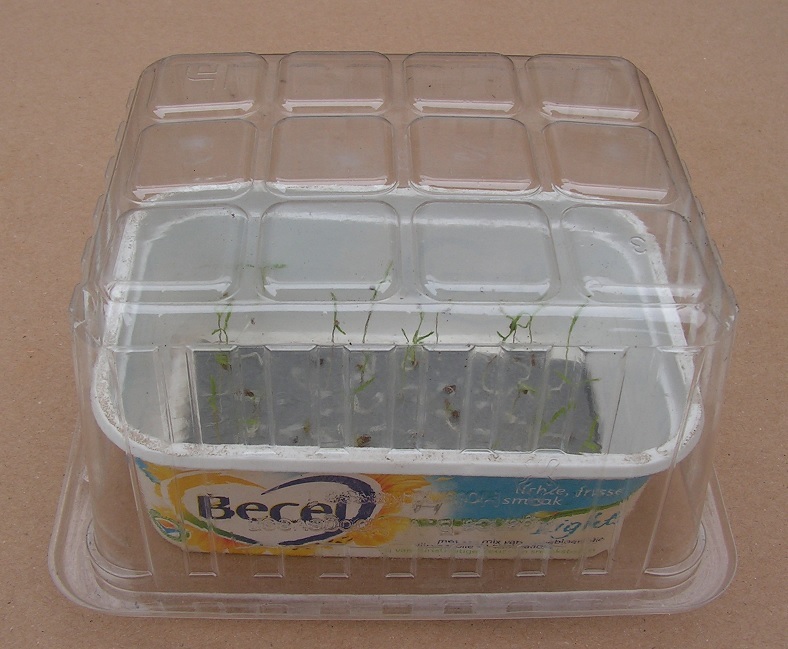 As soon as first plants are visible, remove the lid and put the tray before a window at 59 to 68 F (15 to 20 C). Each day spray sowing soil with cold tap water. Let the plants grow indoors until they are about 1 inch (2.5 cm) high. At freezing weather, keep plants indoors some longer. Put the tray with plants in a room at 50 to 59 F (10 to 15 C) for 24 hours, to let the plants get used to lower temperatures. Then shift the sowing soil with plants into the garden soil (at non freezing weather). In mid winter (January of February), put the plants in the garden soil under a transparent greenhouse. You can grow small carrot plants in a greenhouse in your garden. At non freezing weather in mid winter (January) you can put the greenhouse in the garden. Use a pitchfork or scoop to loosen the garden soil first. This greenhouse has been made out of transparent plate. Two pieces of corrugated plate have been bent round and put on the garden soil. Long and short bamboo sticks keep the plates in the bent shape. In this way there is a double roof over the plants. At each side there is corrugated plate and flat plate put into the soil. To form an isolating side wall. In mid to late winter (January and February) the greenhouse has a double roof and side walls. In late winter (March), one plate is removed from the roof, and the sides. So then the greenhouse has single walls and roof. In early spring (April), greenhouse is removed. From that moment on carrots grow in the open air. Open the greenhouse by removing the top bended plate(s). Use a scoop to loosen the garden soil. Make a small furrow in the soil. The furrow must be some broader and deeper than the size of the tray with carrot plants. Length of the furrow is equal to 2 tray lengths or longer. On the photo above you can clearly see the short and long bamboo sticks. These sticks keep the bent corrugated plate(s) in shape to form the roof of the greenhouse. Put the long tray on a flat surface. Pour (2 small beakers or egg cups) cold water on the soil in the long tray. Wait at least 10 minutes before the next step. The water can fall into the sowing soil. Shoving moist sowing soil is easier. Moist sowing soil sticks better together and does not fall apart so easily during or after shoving. Remove the rubber bands and the L- shaped plate to open the side wall. Put the tray into the furrow. 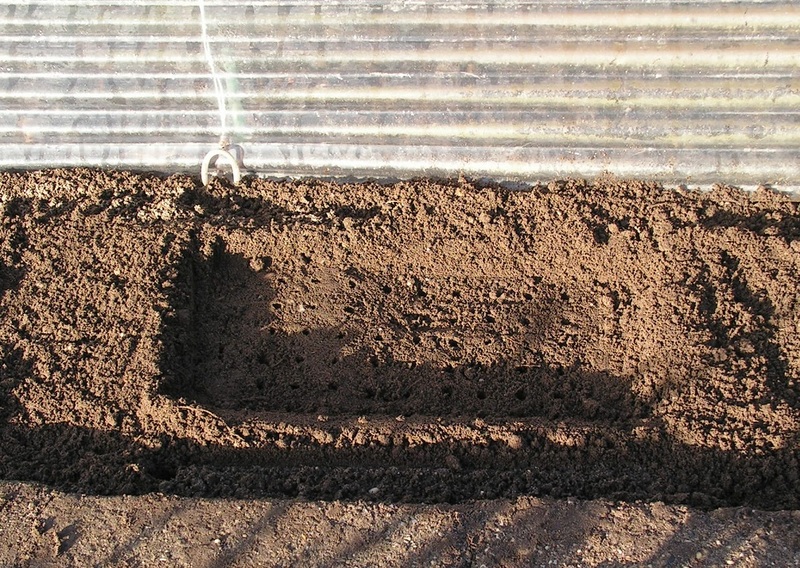 Each time, just before shoving the sowing soil, put the tray in the furrow at the most right position. That is with its open side against the last placed sowing soil part in the furrow. See 2 photos above. Sowing soil with plates (see K)#): Each time put the filling knife between 2 small plates and shift the sowing soil part into the furrow. After shoving, remove the “used” small plates. See top photo here above. Sowing soil without plates: Put the filling knife in the sowing soil in the tray. Put it between rows of carrot plants. Each time, put the knife in the soil, about 2.5 to 3 inch (7 cm) further. Start at 2,5 to 3 inch from the open side of the tray. Shove each part of sowing soil into the furrow using the filling knife. See lower photo here above. During shoving, pull the tray from underneath the sowing soil part. Meanwhile hold the sowing soil part using the filling knife. On the photo above you see many sowing soil parts shoved into the furrow. 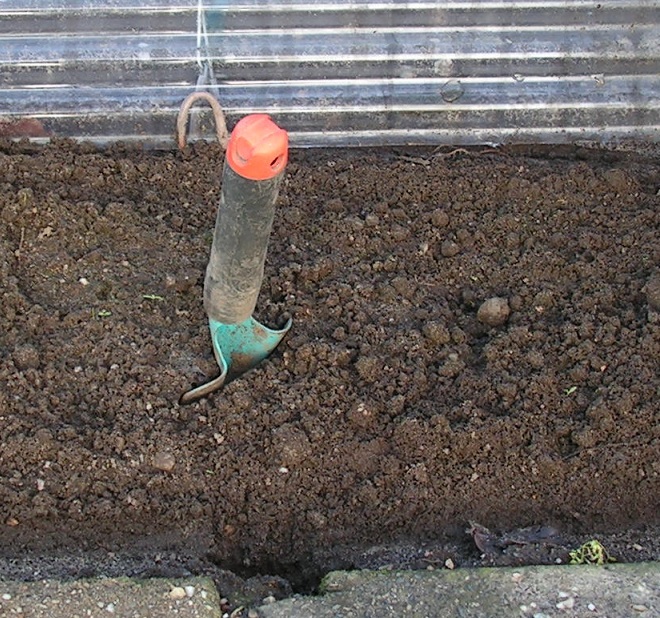 After shoving the sowing soil parts, put some garden soil against the parts to fill the furrow. Then spray cold tap water on the plants and the garden soil. Next step: fit together the greenhouse. When you want to grow early carrot plants of approx the same size you can do following; germinate carrot seeds on moist toilet paper and lay the germinated seeds on the potting soil. When you “fold in” a dark grey plate, the seeds with roots are better visible than in a white box. See 2 photos above. The germinated seeds may not be too “far”. The small root must be just visible at the seed. About 1 to 3 millimeter root length is okay. That is the size of the roots on the photo above, or some smaller. When sowing seeds with longer roots, you can have crooked or bent carrots later. Fold a dark gray plate in a sheet of toilet paper. Lay the whole in a margarine box and spray water on. Strew dry carrot seeds in a white box. Seeds are well visible now. Again and again pick up a dry seed with tweezers or the moist point of a cocktail stick and lay it on the moist toilet paper. “Cover” the seeds with an empty box. Let the seeds germinate at about 68 F (20 C). A filling knife of about 2.5 inch (6 cm) broad is used to shove sowing soil from the tray into the garden soil. On the 2 photos above, you see what happens when 12 inch (30 cm) of sowing soil is shoved; deformation, curling and compressing. The sowing soil at the left part of the tray has “moved” further than the soil at the open side of the tray. This means soil has been compressed. You better shove parts of sowing soil, as shown on the photos below. First sowing soil part has been shoved out of the tray. The tray is moved to the left while the knife retains the soil part. Second soil part has been shoved and put against the first soil part. All 4 parts have been shoved and put together. Mixture: Instead of the sowing soil mixture as mentioned in B)# you can use a mixture of potting soil and agricultural lime (20 to 1). Plates: After filling the tray with sowing soil, you can put plastic plates into the soil. See photos below. You can split the sowing soil in the tray in (4) parts. Between the parts there are 2 plastic plates. Thanks to these small plastic plates you can shove the soil parts using a (smaller) filling knife. Put the knife between 2 plates and push against the soil part. The plastic plates help to keep the soil parts in shape during shoving. You need extra plates that can be sawn from a tray. When using small plates in the soil, the long sink mat will probably not “fit”. You can use a small mat. This is my first harvest at May 25. Carrots are crooked a little. They tasted well. These carrots grew in a tray filled with potting soil. When you have sandy soil in your garden, you can sieve (almost) dry sand using a big sieve. Then you can let the sand dry further on paper in a cardboard box. Let dry on a warm dry place (for example an attick). You can do the same with masonry sand or sandbox sand. Garden sand, sieved and dried. Also needed: a wooden board, a hack saw, a mall slat, about 0.8 inch (2 cm) wide and a marker. Put the tray aside. Use the slat and the marker to draw a line. Put some extra short wooden slats or blocks on the board. They serve as a support during sawing. Put the tray over the small slats and blocks. Then saw along the line. This photo shows the tray after sawing. Remove plastic flakes using a knife or sand paper. In the middle of the tray there can be a round “mound”. This can hinder shoving. Use a sharp knife and sand paper to remove this mound. Easy to be done after sawing (removing one short side). Attention: Ater removing the mound there can be a small hole in the bottom of the tray, as shown on the photo above. That is no problem. Due to the removable side wall, the tray is not waterproof anyway. So you can use the tray with a small hole in the bottom. To close the open end of the tray you need a L-shaped plate. You can cut a L-shaped plate from a plastic freezing box. A close up photo of a L-shaped plate. On the photos above you can see how the L-shaped plate is fixed to the tray. To shove the sowing soil parts you can use a filling knife. The knife must fit in the tray. When you have a knife that is too wide, you can narrow it. This is described below. Determine the correct size of the knife. Use a marker. Put the knife (between 2 pieces of cardboard) in a bench vice. Use ear protection during next step (sawing). Saw a piece of metal from the knife. A filling knife with cut sides. File the cut sides of the knife. The filling knife after sawing and filing, ready for use. To make the sowing holes in the soil, you use a small round stick. The stick is made out of a wooden spoon (€ 1,00). Saw about 5 inch (12 cm) from the handle of the spoon to make the sowing stick. The thickness of the stick is about the same as a round hole in the mat. This is too thick. The stick should turn in the mat hole easily. So you need to make the stick thinner. Making the stick thinner is easy when you do it this way; grip one side of the stick in a drilling machine. Wrap a piece of sand paper around the other side of the stick, the side that needs to be made thinner. Have the drilling machine turn slowly while you “press” on the sand paper. After some “making thinner”, test if the stick fits loose in a mat hole. If not, repeat the “thinning step” with sand paper and drilling machine. And then test again. To “bevel” the end of the stick you can use a pencil sharpener, one that can handle thick pencils. On the photo above you see (from top to bottom) sticks with no, much or little bevelling. Use the stick with little bevelling (the middle one) for sowing dry seeds. 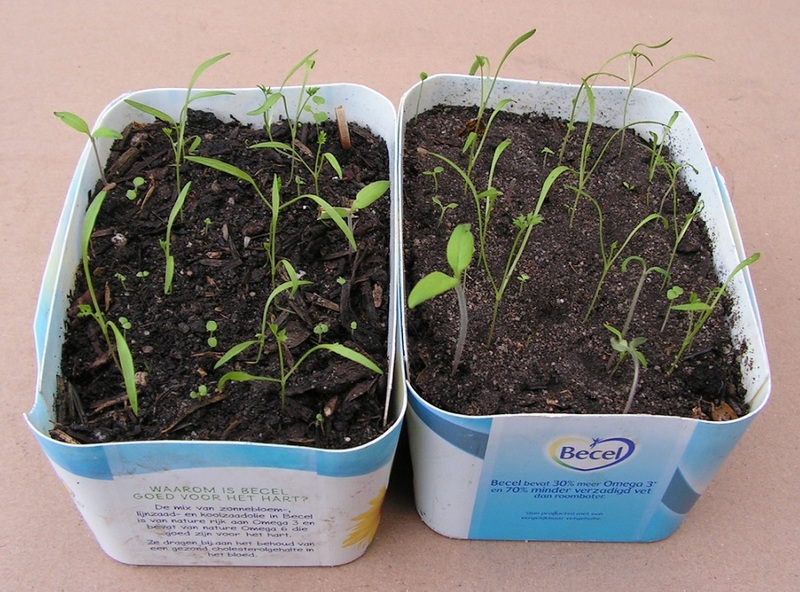 Use the one with no bevelling (the top one) for sowing germinated seeds. The reason why has been described above at D)# Sowing carrot seeds and strewing sand on. Put a (thick) elastic band around the thin end of the stick, about 0,8 inch (1 cm) from the end. You can put a rubber band or a rubber O-ring around the stick. The rubber band or O-ring must “grip” around the stick, this means not shifting easily. Tip 33 describes the making of a shift fall tray. The “drop tube” of this tray has been made of a of an empty silicone nozzle (as used at sealant tubes). This idea is from Dirk, a gentleman from The Netherlands. The silicone nozzle has been cut straight. The end of the nozzle is thinner than a mat hole. Put a rubber band around the end of the fall tube, about 1/3 inch (8 mm) from the end. Instead of a rubber band you can use a rubber O-ring or rubber ring. The rubber band or ring must “grip” around the nozzle, this means not shifting easily. This entry was posted in carrots, early. Bookmark the permalink.